Every player inside a large zone, every player has a ball. Each player dribbles the ball around avoiding contact with other players. On the coach’s signal, the players perform the footskill that was demonstrated. In between signals, the players should be focused on getting frequent touches. They do not need to run extremely fast, but they should be touching the ball very frequently. 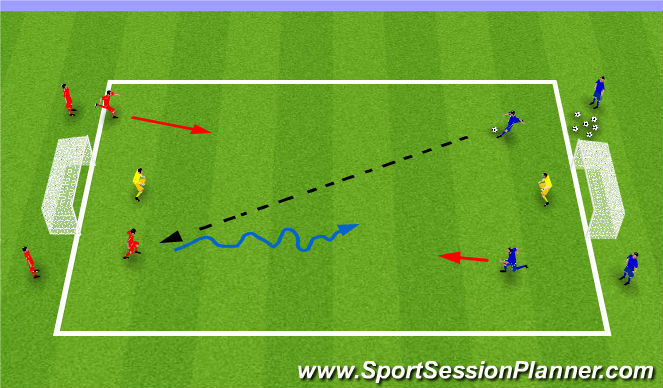 •Skills to work on: Turning: Pullback, ½ Zico (New), Full Zico (New). Forward: Stab Push, Scissors, 1-Foot V-Pull, 2-Foot V-Pull. Set up one field about 25 x 30 and separate the kids into two teams. Each team sets up at one end of the field in two lines (off the field). Team A plays a ball in to team B and the first two players from each line play making a 2v2 game to large goals with goalkeepers. Any time a goal is scored, the ball goes out of bounds, or the game lasts longer than 30 seconds the players on the field go off to the outside and new players begin a new game. The transition should be quick. After 10-12 games, make sure you switch so that both teams receive the ball to start. • What body shape should you have when defending? Side on at an angle to force attacker to one side, not square. 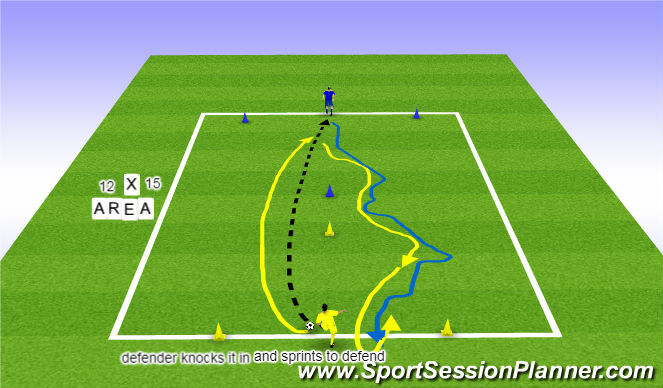 Facilitate the game and help with positions, positioning, and game format. 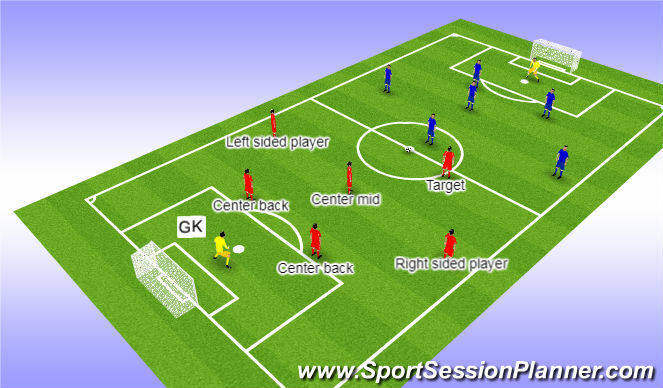 Facilitate a basic scrimmage with a goalkeeper and six field players. Allow the kids to “PLAY” but give guidance when necessary. Use a “coaching in the game” approach to emphasize the topics from this week’s training. Be sure to use the labeled names for the positions! Make sure we emphasize that the players implement the defensive principles learned during the week. Please be active even during the scrimmage, if you have to stop it and make a coaching point please do.